How can we represent conversations between a small sample of users, such as the email or SMS converstations between James Murdoch’s political lobbiest and a Government minister’s special adviser (Leveson inquiry evidence), or the pattern of retweet activity around a couple of heavily retweeted individuals using a particular hashtag? The chart looks a bit complicated at first, but there’s a lot of information in there. The small grey dots on their own are tweets using a particular hashtag that aren’t identified as RTs in a body of tweets obtained via a Twitter search around a particular hashtag (that is, they don’t start with a pattern something like RT @[^:]*:). 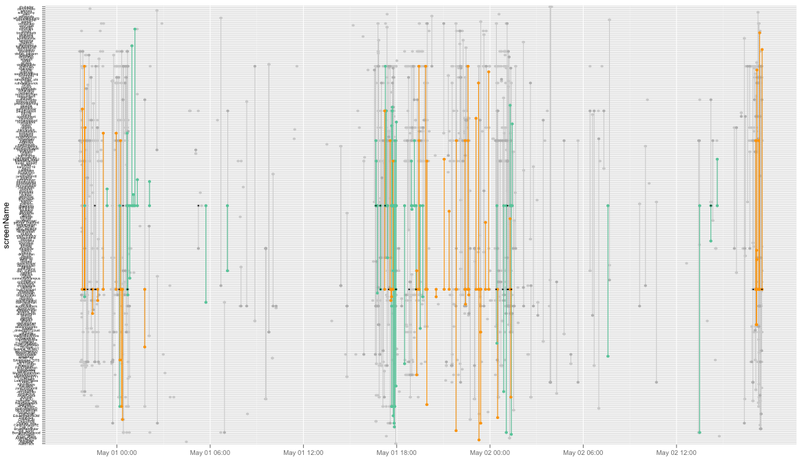 The x-axis represents the time a tweet was sent and the y-axis who sent it. Paired dots connected by a vertical line segment show two people, one of whom (light grey point) retweeted the other (dark grey point). RTs of two notable individuals are highlighted using different colours. The small black dots highlight original tweets sent by the individuals who we highlight in terms of how they are retweeted. Whilst we can’t tell which tweet was retweeted, we may get an idea of how the pattern of RT behaviour related to the individuals of interest plays out relative to when they actually tweeted. Here’s the R-code used to build up the chart. Note that the order in which the layers are constructed is important (for example, we need the small black dots to be in the top layer). One thing I’m not sure about is the order of names on the y-axis. That said, one advantage of using the conversational, exploratory visualisation data approach that I favour is that if you let you eyes try to seek out patterns, you may be able to pick up clues for some sort of model around the data that really emphasises those patterns. So for example, looking at the chart, I wonder if there would be any merit in organising the y-axis so that folk who RTd orange but not aquamarine were in the bottom third of the chart, folk who RTd aqua but not orange were in the top third of the chart, folk who RTd orange and aqua were between the two users of interest, and folk who RTd neither orange nor aqua were arranged closer to the edges, with folk who RTd each other close to each other (invoking an ink minimisation principle)? Something else that it would be nice to do would be to use the time an original tweet was sent as the x-axis value for the tweet marker for the original sender of a tweet that is RTd. We would then get a visual indication of how quickly a tweet was RTd. PS I also created a script that generated a wealth of other charts around the lak12 hashtag [PDF].